Putney High School is today celebrating record GCSE results, with 93 per cent of entries achieving A* or A grades. Almost three quarters of girls secured at least 10 A* or A grades, and more than one third earned 11 A* or As. 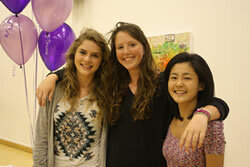 Three girls – Sae Kohara, Megan O’Shea and Charlotte Wootton - scooped 12 straight A*s while seven achieved 11 straight A*s. Four earned 10 straight A*s. Isabel van der Linden received her results while training with the national centex lacrosse team – little more than a week after co-captaining the England U17 team in a competition staged in Hanover, Germany, to run alongside the Lacrosse World Cup. Putney reported 95 per cent A* and A grade passes in the three sciences, with three quarters of science entries achieving A*. Furthermore, 98 per cent of English entries were A* or A. Results then off to Reading Festival to celebrate! Other subjects achieving outstanding success included Music, Religious Studies and Statistics, with all entries achieving A* or A grades. The average points per pupil was 574 – another record for the school.